"Better patterns and increased shot velocity help you hit what you're shooting at. A back-bored barrel is a shotgun barrel that has a bore diameter increased beyond standard specifications. 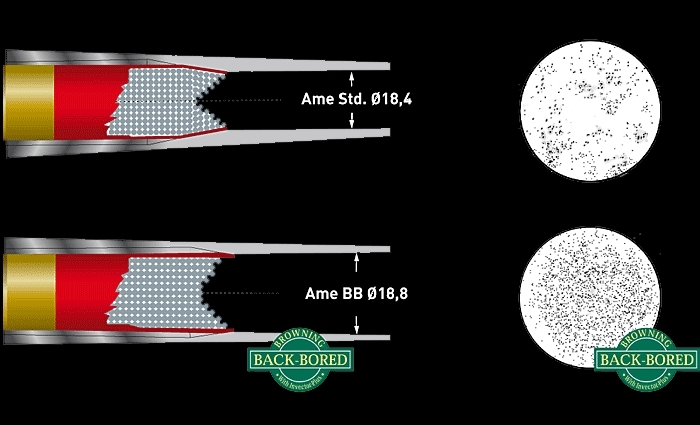 Increasing the bore diameter of a shotgun barrel greatly enhances its performance. A larger bore diameter reduces friction of the shot charge against the barrel wall. Instead of trying to overcome friction, powder gases expend more energy on the wad base, resulting in an increase in shot velocity. Because there is less constriction or pressure from the barrel walls on a shot charge, there are fewer deformed shot pellets. A greater number of ballistically superior round pellets in a shot charge gives you exceptionally uniform patterns -- delivering more shot pellets in the effective part of your pattern." Above, one of the many delusional artist's representations of the mysterious back-bored barrel. The reality is something drastically different. Browning is far from alone in claiming mysterious benefits of back-boring. Apparently, the 16 gauge is immune from these benefits, as is the 28 gauge, and only Browning produces a “back-bored” 20 gauge. SAAMI publishes standard specifications for the 12 gauge. SAAMI standards are .725 inch +/- .020. Whether .705 inch all the was to .745 inch, they are all within standard specification, according to SAAMI. The notion that .740 inch is not a standard specification is false on its face, according to SAAMI. Any time you enlarge a bore, you naturally increase its volume. That means lower velocity every time, as pressure decreases throughout the length of a larger barrel. Steel shot does not deform like lead, so the notion of keeping pellets round as far as steel is nonsensical. You can shoot gimmick loads like Winchester BlindSide (hex steel shot) through any barrel you want and it isn't going to become round. Some people buy this junk anyway. The idea of shot friction against the barrel is also ridiculous, for with a plastic shotcup no shot so much as contacts the barrel in the first place. There is wad drag from the sealing base of the wad, the reason that 25 – 26 inch barrels produce more velocity than 30 inch barrels. However, there isn't less drag on a large barrel: there actually is more, as the circumference of the inside diameter of the barrel is larger than on a smaller barrel. The more area in contact with the wad, the more friction there is, the more wad drag there is. Neil Winston has conducted numerous independent tests: http://www.claytargettesting.com/Bore_Diameter/Bore_Diameter.pdf . improved the patterns produced by their guns at all.